If someone would’ve told me five months ago that, by October, I’d be craving a chilled suimono salad once a week, I would’ve looked that person right in the eye and said, “What the hell a chilled suimono salad?” After hearing that it’s made with sea bean, cucumber, squash blossom, wakame seaweed, tofu, and served in a dashi broth ($14), I would’ve politely explained that I’m not the biggest fan of cucumber, seaweed, tofu, or dashi broth and proceeded to laugh at such a ridiculous prediction. Ah, silly, silly girl. This unique salad, the ultimate expression of freshness, is one of many reasons why in a very short span of time Nombe has become one of my favorite restaurants. It was in the spring when Nombe first impressed me with its California-inspired take on traditional Japanese izakaya fare, offering both a fixed selection of dishes, as well as many that evolve with the season. Now five months later, even with the summer’s proliferation of much-hyped restaurants, Nombe has continued to stand out from the crowd. First of all, the atmosphere is just plain fun. The feel of a casual, laid-back diner is created by tiled, black-and-white checkered floors and no frills seating. Miscellaneous lighting fixtures, like large paper lanterns and metal stars, similar to items found at Cost Plus, add cultural character and energy to the space. This random, culture-blending décor doesn’t take itself too seriously, a feeling which makes you want to kick back, relax, and laugh with friends. Oh, and also drink copious amounts of sake. Luckily for that, there are over 75 premium sakes to choose from, and a sake expert on hand to help guide you through the mysterious world of sake pairings. Gil Payne, a certified sake sommelier who also happens to be one of the owners, is a walking database of sake knowledge, more than capable of educating you about their diverse selections and steering you in the right direction. But what truly differentiates this restaurant from everything else in San Francisco is the personal cuisine of Nick Balla. In many ways, Japanese cuisine naturally lends itself to California fusion by placing extra importance on the freshness of ingredients. Since the freshest ingredients are those that are in-season and found locally, it makes sense that Chef Balla would work these uncommon items into traditional preparations, putting a modern twist on classic dishes. While this seasonality is apparent in the nightly specials, where dishes are created to emphasize certain limited- time ingredients, in most cases the integration is subtle. Only a few Agemono (fried) listings evolve with the season, with asparagus tempura offered in the spring, corn fritters in the summer, and fried Brussels sprouts in the fall. Similarly, the to-die-for beignets are always served with a seasonally-paired jam, with the apricot jam of summer recently making room for the quince jam used in fall. But what about all of Nombe’s signature dishes? Frankly, changing the preparation of Braised Pork Belly kimchee with maitake mushroom($14), already a perfect balance of fatty richness and assertive spice, seems just plain mean. 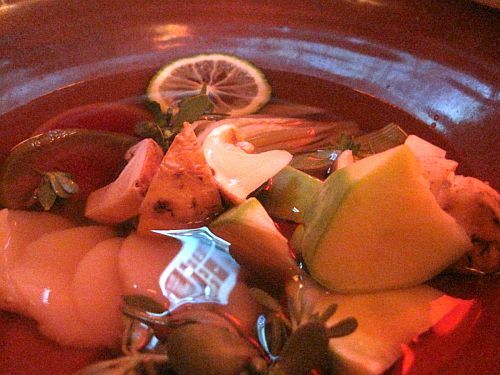 While items like pickled okra may replace pickled bitter melon, fear not!, the majority of Nombe’s signature dishes remain unchanged. Regulars can keep coming back for their favorite plates, and first-time diners have no excuse for not ordering some of the house specialties, which include the Black Cod served with spinach, fennel, leek and miso ($13), the fried Chicken Wings paired with honey and Serrano chili sauce ($9), the Tsukune (a grilled chicken meatball) with Egg ($7), and the Wagyu Bavette Steak Tataki ($15). With generally large portion sizes, and the average dinner item only costing $8-$10 (the most expensive dish is priced at $16), you could easily have a full-blown feast without having a full-blown heart attack when the check comes. And, with an even cheaper late night menu (available Fridays and Saturdays from 11-1 am), even the hordes of poor, young Mission partygoers can find a delicious bite to eat without breaking the bank. Through the cunning use of skewers, pickles, and sake, Nombe has carved out its own unique niche within the San Francisco restaurant scene. Because of this, just one year after opening this little diner-that-could is now on the national radar, named one of the 20 best new restaurants by Esquire Magazine. And it’s easy to see why.